Fully articulated, 8-inch tall H.E.L.P.eR. and Sgt. Hatred Action Figures! Bif Bang Pow! 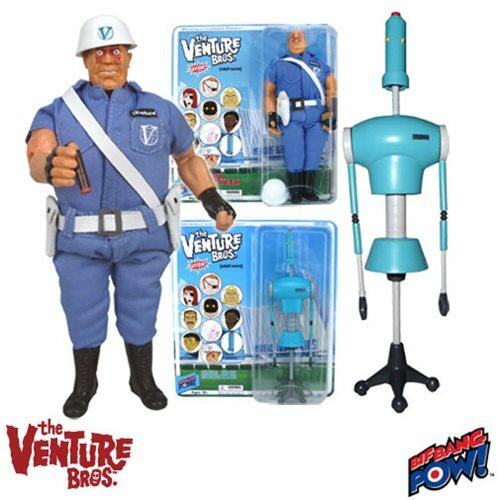 continues to amaze with this line of fully articulated, 8-inch tall action figures based on Adult Swim's all-the-rage animated series The Venture Bros. You'll find the most popular and recognizable characters from the show faithfully represented in real fabric clothing and a 1970s retro style that accurately portrays that distinctive action-comedy mix that has become synonymous with the TV series! Each figure comes individually carded in blister packaging. Ages 18 and up. The action figure you love to hate. Here's Sgt. Hatred in his blue fabric outfit (with nametag and logo), complete with vinyl gun belt, strap, and boots. He also comes with a removable helmet, gun, and cigar accessories... and an abundance of attitude! Check out the "H" symbol on his face, too. What more could you ask for? Devoted fans of The Venture Bros. will recognize H.E.L.P.eR. (Humanoid Electric Lab Partner Robot) from the series. In cool-gray and blue, he features wheels and multiple points of articulation at the neck, shoulders, elbows, and waist. He also sports a removable head, arms, and torso... in preparation for future interchangeable parts! Couldn't you use a personal helper robot? H.E.L.P.eR. does not include fabric clothing.